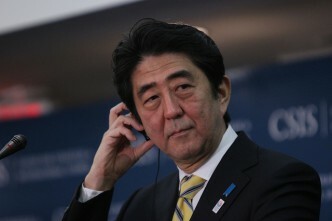 The Japanese Prime Minister came to Singapore to announce Japan will have a military and security role in Asia’s future. Shinzo Abe told the Shangri-La dialogue: ‘Japan intends to play an even greater and more proactive role than it has until now in making peace in Asia and the world’. 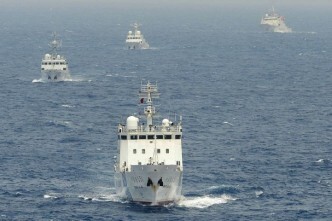 Japan, he said, would offer its utmost support to ASEAN ‘to ensure the security of the seas and the skies, and thoroughly maintain freedom of navigation and freedom of overflight’. In the Abe description of what’s happening in Asia, China is challenging the status quo while Japan is standing up for the law. 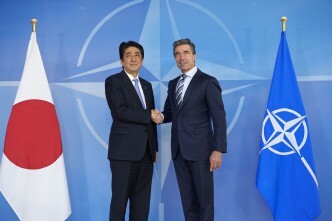 Shinzo Abe knew the history he was making and the history he was stepping away from. During questions, a PLA Lieutenant-Colonel asked how Japan could speak about regional peace given its history of war and Abe’s visit in December to the Yasukuni Shrine. The Prime Minister replied that he had repeatedly expressed remorse for the war and that Japan had changed to become a peaceful, democratic nation that respected law. Recently President Barack Obama of the United States and I mutually reaffirmed that the US-Japan Alliance is the cornerstone for regional peace and security. President Obama and I also mutually confirmed that the United States and Japan are strengthening trilateral cooperation with likeminded partners to promote peace and economic prosperity in Asia and the Pacific and around the globe. When Australian Prime Minister Tony Abbott visited Japan at the beginning of April, we reaffirmed this exact stance, namely that in security affairs, we will further the trilateral cooperation among Japan, the US, and Australia. 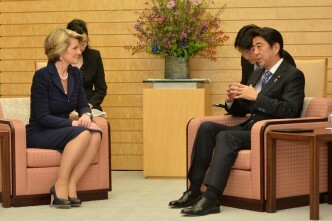 We clearly articulated to people both at home and abroad our intention to elevate the strategic partnership between Japan and Australia to a new special relationship. Listening to Abe deliver his keynote address, I compared his tone and content to that of previous Japanese Prime Ministers I covered in Southeast Asia in the late 1980s and early 1990s. At that stage, Japanese leaders were getting the polite, correct reception accorded to the richest man in town; no more deadly riots of the sort that greeted Prime Minister Tanaka when he arrived in Jakarta in 1974. By the time I was following Japanese PMs around Singapore, KL and Jakarta, the script was well established. At each ASEAN stop, the PM would promise Japan’s leadership for Asia’s bright economic future, apologise sincerely for WWII and then be bombarded with questions about how much more local management there could be in the new Japanese factories springing up across the region. The apology was never quite enough, nor was the promise of greater local influence in Japanese companies. 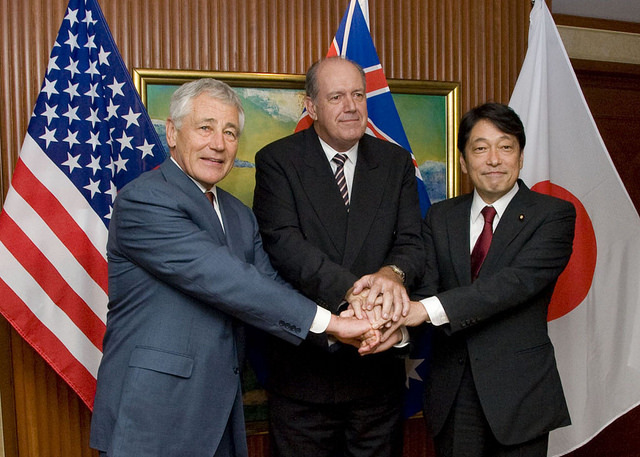 ASEAN was more worried about being dominated by Japanese managers than any return of the Japanese military. In a more explicit way than the other ASEAN leaders, Lee Kuan Yew would marvel at what the Japanese had achieved and ruminate on the dark places in the Japanese soul he’d seen during the war. Japan had to be careful about its prerogatives. When Malaysia’s Mahathir proposed an East Asian Caucus (a caucus without the Caucasians) he wanted Japan as its leader. The rest of ASEAN wasn’t too keen and, just as importantly, Japan wouldn’t step up to accept. Then, relatively suddenly, the tide turned. Japan meandered off to wallow in a lost economic decade while China, shaking off its pariah moment after the Tiananmen massacre, hit cruising speed. 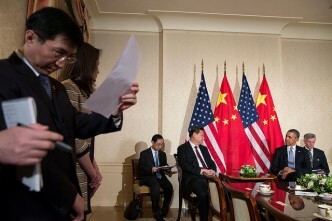 The weight of history means Abe had to come to Singapore to give his Asian security speech. He couldn’t do it anywhere else in Northeast Asia; in China the protests would be huge, Korea would be deeply chilly, even Taiwan wouldn’t risk it. And the rule of law for all of us. Graeme Dobell is the ASPI journalist fellow. 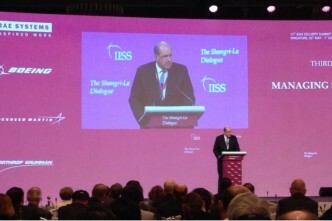 He is reporting from the 2014 Shangri-La Dialogue in Singapore. 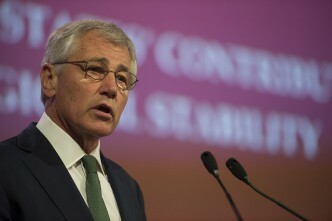 Image courtesy of Flickr user U.S. Pacific Command.